EMSA North was registered as a not-for-profit organization on April 1, 1999. We have been in operation for over 33 years and began as a small group of volunteers wanting to offer soccer programs to youth in their communities. Mario Charpentier, George Juhasz, Barrie White and Jim Sweeney were the first members of EMSA North. 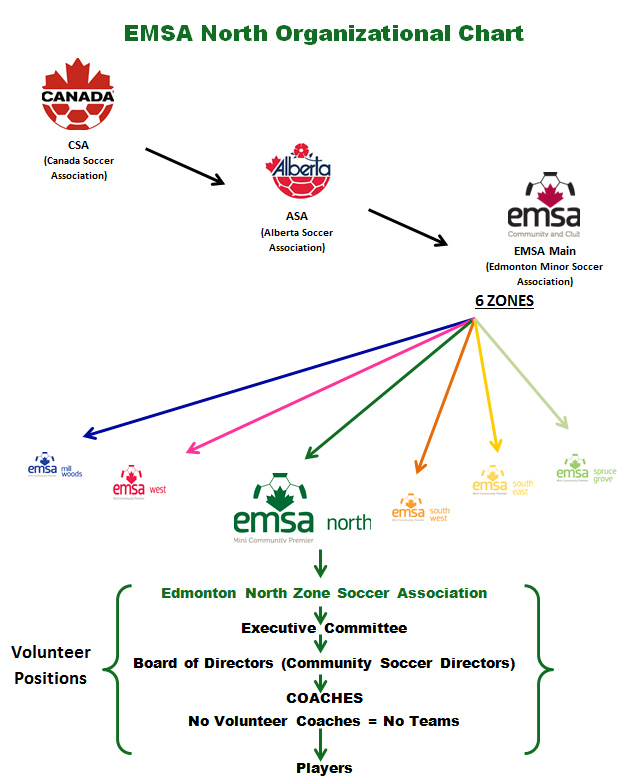 EMSA North programs began in 1977 and soccer groups in North Edmonton began to emerge. Many of the north end European roots helped to propel soccer in north Edmonton to where it is today. Currently, soccer is the largest youth sport played in Alberta – surpassing hockey. EMSA is the largest youth sport organization in Alberta. ENZSA is an active member of the Edmonton Minor Soccer Association (EMSA), which is part of the Alberta Soccer Association and the Canadian Soccer Association and FIFA. We have close to 500 soccer teams in our association with over 7,900 players (U5 -U19) registered annually in the Indoor and Outdoor Programs. EMSA North is made possible by our dedicated volunteers and three office staff. Without the numerous volunteers our programs would not be possible. EMSA North is extremely proud of its volunteers and is tremendously grateful to them for their effort. EMSA North exists to promote, develop and govern the soccer program on behalf of it’s members. It provides, wherever possible, soccer playing opportunity for every youth in its zone, regardless of gender, skill, ability, level or race. To foster and encourage good character and sportsmanship through the principles of fair play and to ensure the welfare and fulfillment of each individual player.